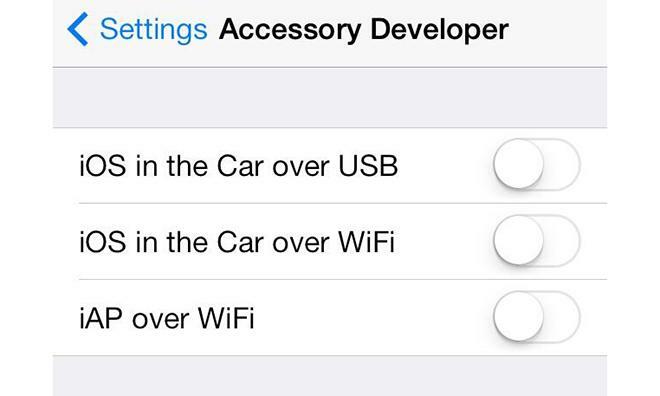 A newly discovered developer option in Apple's iOS 7 beta shows controls for "iOS in the Car" over both USB and Wi-Fi, suggesting the company's AirPlay protocol may be used to stream visual and audio data to supported automotive infotainment systems. According to Hamza Sood, who discovered the options in the iOS 7 beta's "Accessory Developer" settings menu, the three toggle switches seen above are preferences linked to Apple's AirPlay. Apple's iOS in the Car made its debut at this year's Worldwide Developers Conference in June. As an extension of Siri Eyes Free, the feature grants access to basic phone functions, but goes further by displaying a customized version of iOS on an infotainment system's screen. While it appears that "normal" hard-wired USB connections will still be an option for iOS in the Car, via a 30-pin or Lightning input, the new wireless protocol support would bring an even greater level of convenience for users. With AirPlay over Wi-Fi, an iPhone can beam Siri, Maps, music, communications, and other information to a car's receiver without being taken out of a user's pocket or bag. As a side note, Apple's choice to use AirPlay could be one of the reasons why BMW said in June that it was reluctant to throw support behind iOS in the Car. At the time, the German auto maker claimed it would have to make significant architectural changes to the company's built-in iDrive and ConnectedDrive interfaces, adding that the process of integrating iOS into a dashboard system is "not as simple as it sounds." The luxury brand does, however, plan to support Siri Eyes Free in its 2014 model-year lineup. For now, major automotive manufacturers planning to adopt Apple's second-screen iOS in the Car capabilities include Honda, Acura, Mercedes-Benz, Nissan, Infiniti, Ferrari, Chevrolet, Hyundai, Kia, Volvo, Opel and Jaguar.